Discussing adapters–this being an international conference–and mention how much easier it is now that everything plugs into usb slots for charging. Compared to ten years ago, when my first-generation mp3 player (before ipods took off) plugged into its cord, which led to its enormous charger, which hung from the enormous Northern-Europe-to-North-America power converter, with an additional prong adapter to fit in the recessed outlet (why, Europe?). The whole apparatus hung from the wall like an engorged tick. I am not old enough for this. A sailboat floats serenely past the window. Practically no one even turns to look. Already trying not to laugh; the boat doesn’t help. It turns out gefriesdroogde meelwormen means exactly what I thought. I really wouldn’t have minded being wrong about that one. Wish I hadn’t opened it,I could have sent it to someone for Christmas. Wonder who. It would be fun to live tweet these thoughts. I don’t think that’s what the organizers had in mind when they created the conference hashtag, though. Mm, linguistics mealworms. Bookworms? Cooking can be entertainment, community, an art form. It can also be one of those many tasks, like brushing your teeth and taking out the compost, that you have to do almost every day or risk losing your teeth/a smelly kitchen/eating ice cream for dinner again, even though you don’t even want it at this point but don’t feel like losing another 45 minutes to the kitchen. The garden chef and the pajama’d nommer in me have come to some compromises. Here are some of the ways they make real food, full of ingredients, without spending hours a day in the kitchen. 1. Read food blogs and recipes. Sometimes when I’m sitting in the office but really don’t want to work on linguistics, I read recipes online. Sometimes I pin them on my pinterest board for future use, sometimes I just note the techniques and use them with completely different ingredients when I’ve run out of conventional combinations in my kitchen. 2. Keep a core of real foods that keep well and cook up easily in your fridge and pantry. NTS does most of the grocery shopping, since it’s on his way home. If I don’t give him a list, he still stocks up on bell peppers (red, green, and yellow; they’re all reasonably priced here), courgette (zucchini), cheddar cheese, milk, greek yoghurt, carrots, chickpeas, hommous, onions, etc. I keep a number of dry whole grains on hand, too, since they cook up with little effort and keep for a long time when dry. A pepper or carrots and some hommous are a quick way to add veggies to lunch. Any whole grain can be cooked up with or without bouillon/stock and mixed with any combination of cooked or uncooked veggies to make a filling side dish or meal. 3. Leftovers! Making two of three days worth of food doesn’t take much more effort than making a single meal. Cooking for an hour is suddenly a lot less problematic when you share the results over several days. At least double the amount of grain you make, as it takes literally no extra effort and can be used for salads for the next few days. 4. Put an egg on it. 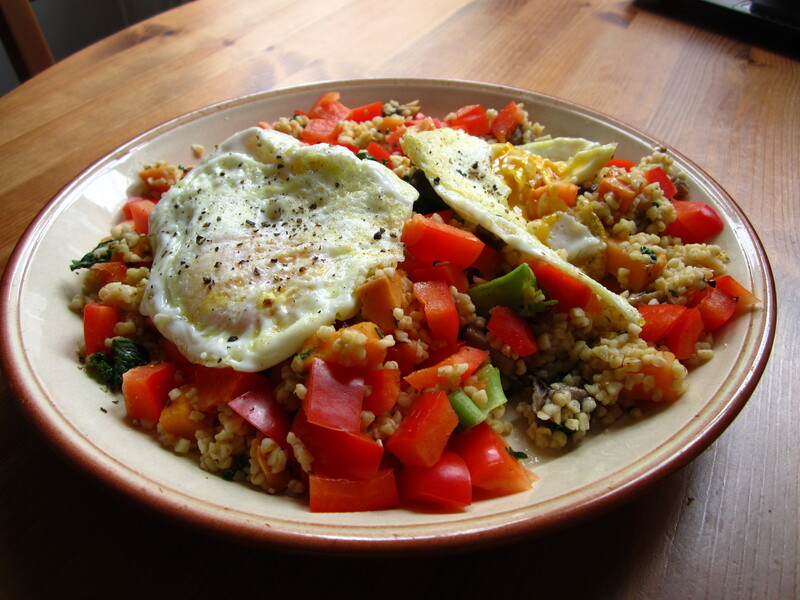 An egg or two over easy, with the yolk soaking into everything, makes leftover grains much richer. If you’re good at poaching eggs, that would probably work too. If you can poach an egg, though, you probably know these things already. Today’s lunch, for example, is yesterday’s mushroom, kale, sweet potato, edam cheese, and bulgar wheat salad with the addition of a chopped red pepper and eggs. Not practical if you’re going in to the office, but you can always use it for dinner, and it takes less than ten minutes. I can’t decide whether that looks appealing or weird. It was tasty, though. 5. Know when to compromise. I use bouillon cubes instead of making my own stock; dried herbs instead of fresh; canned beans instead of dried; pre-made salsa, spaghetti sauce, indian sauces and (whole-grain) pasta. You have to find the mix that works for your life. Do eat the fresh veggies, though. How do you fit real food and cooking into your life? I’m proud to say that I now make a full-time living as a professional yurt builder. These days I mostly just go camping. It doesn’t stop us from creating the best encampments ever. Our last encampment featured a sapling table, which we actually used to make and eat dinner and play games. The fairy lights strung on poles around the top provided the crowning touch, along with a fair amount of light. The Old Frisian word is used for ‘marriage’ and ‘guardianship’. To/of a woman, of course. My little feminist soul hurts. Got caught up in reading feminist blogs. So much is wrong. Now the rest of my soul hurts, too. I really need to remember: one article at a time. Maybe two. Not a whole year of archives at a time. Since I usually read about permaculture and other happy things, this is a thing I forget when I read about less cheerful topics. I feel like I really should have gotten more out of the two hours I just didn’t spend on research. I think I’ve cheated myself, somehow. Remember, kids: the internet is not just a toy. 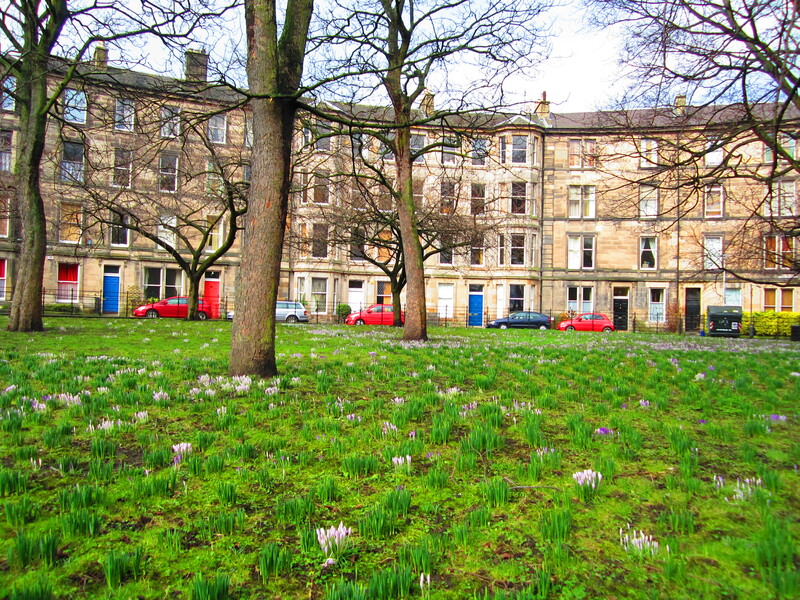 Seen on my ramblings: On my walk to work this morning, this entire wedge of land was covered with patches of crocuses, beaded with tiny droplets of dew. It just smelled like spring. 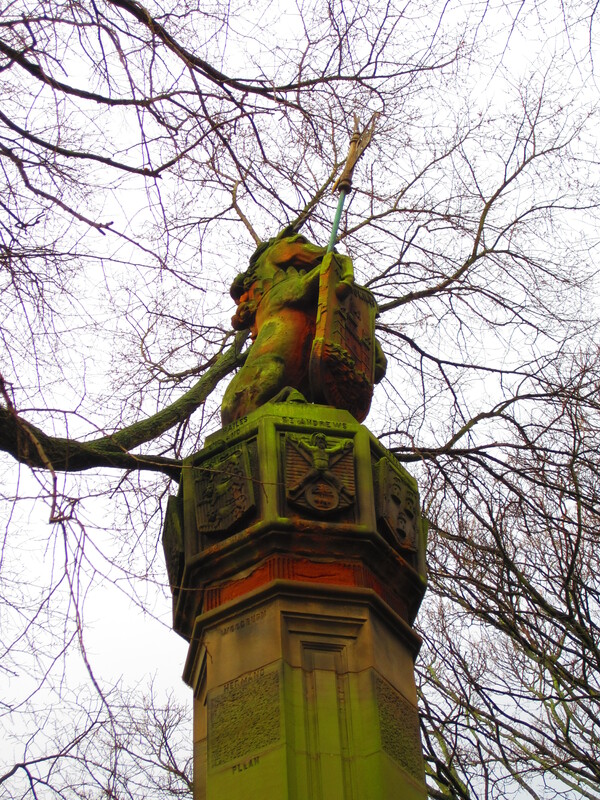 The unicorn on the edge of the same square. Why a unicorn? Well, it’s 147% more interesting than another guy on a horse, for starters. Although horses without horns are pretty, too. 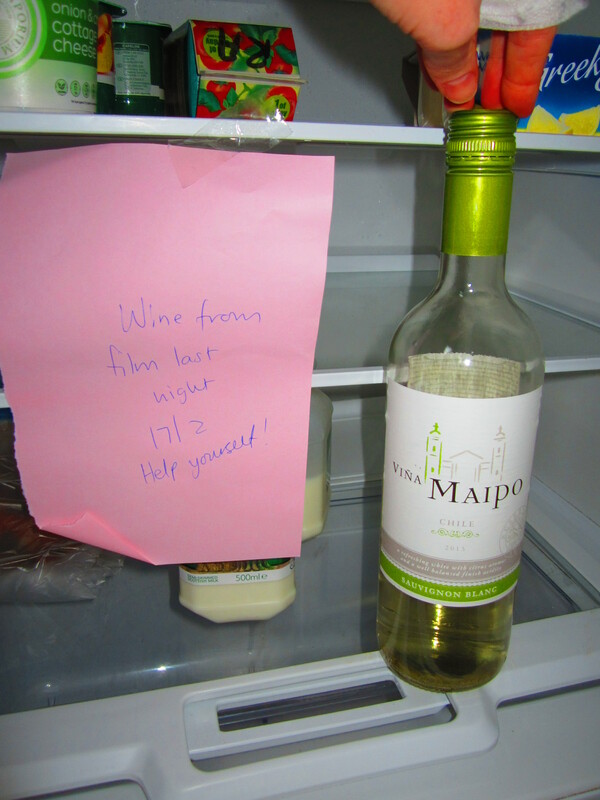 “Wine from film last night 17/2 Help yourself!” A nice thing to open the office fridge on on a Tuesday morning. 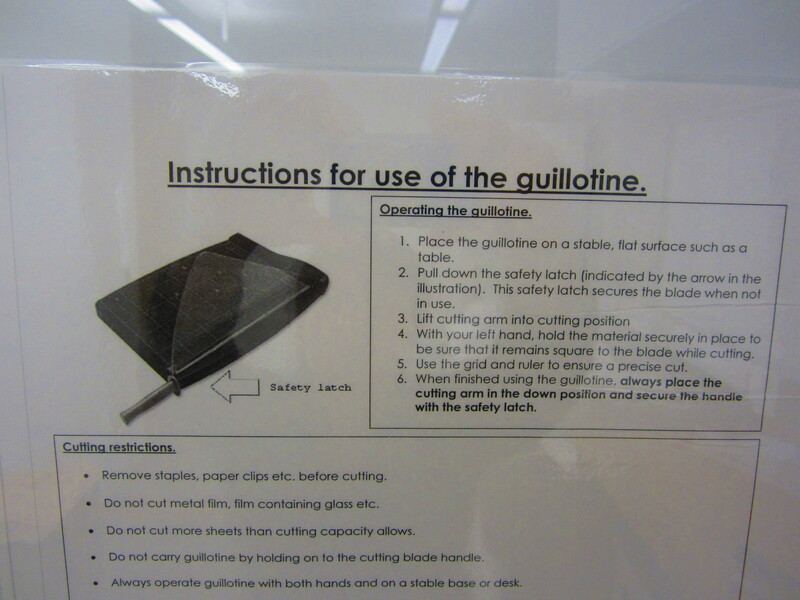 Slightly more unsettling: “Instructions for the use of the guillotine” notice in the copy room. No matter how much your head knows it’s just an office supply, there’s something about “guillotine” that will always say “reign of terror”. Besides, your head has a vested interest in the matter and can’t be trusted to be objective. Lady Day: 25 March, the Feast of the Annunciation. Also a quarter day, one of four days in the (southern) English year on which servants were hired and dismissed, rents were paid, new leases started, and accounts settled. The quarter days in Scotland, Ireland and northern England, on the other hand, more nearly matched the dates of old fire feasts than the equinoxes and solstices.